Protein Cookie: A Rocky Road-flavoured indulgence, this is a great pick-me-up after a tough workout. It’s packed with protein that helps to support you training goals. 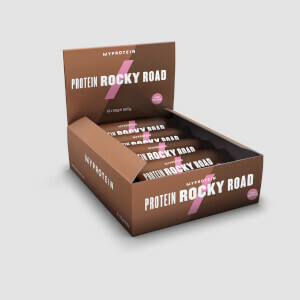 Protein Rocky Road: With 24g, our Protein Rocky Road bars are pure perfection – with mouthwatering chocolate and chewy marshmallow upgrading treat time, without derailing your diet. Baked Protein Cookie: A chocolatey treat for all occasions, it’s also crammed full of protein that helps to support all your training goals. 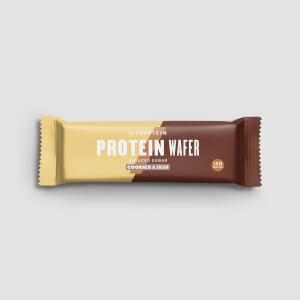 Protein Wafer: With less sugar than standard supermarket alternatives, our Chocolate Hazelnut wafer satisfies your sweet tooth without derailing your training. Protein Chocolate: With 19g of protein supporting muscle growth1 while making sure your sweet tooth is satisfied, you can’t go wrong with Protein Chocolate. * Products may be swapped subject to availability. 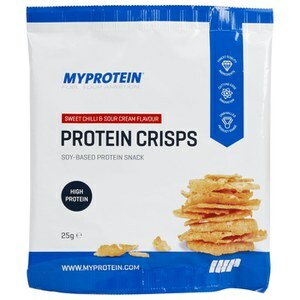 When to enjoy the Protein Snack Box? Absolutely anytime! All our snacks are perfect for when you’re on the go. Whether at home, in the office, or on the road, keep your training on track. For allergens, including cereals containing gluten, see ingredients in bold. May also contain nuts and peanuts. Please see individual product pages for full details. Milk Protein, Hydrolysed Gelatine, Glycerine, Palm Oil, Soy Protein, Chocolate Chips (4.4%) (Cocoa Mass, Sugar, Emulsifier (Soya Lecithin), Flavouring), Sugar, Reduced Fat Cocoa Powder, Marshmallows (3.5%) (Sugar, Corn Syrup, Water, Dextrose, Beef Gelatine, Corn Starch, Flavouring, Natural Colour (Beetroot Red)), Soy Protein Crispies (2.2%) (Soy Protein Isolate), Oat Flour, Fruit Pieces (1.7%) (Concentrated Apple Puree, Strawberry Puree), Fructose, Sugar, Humectant (Glycerine), Wheat Fibre, Palm Oil, Acidity Regulator (Malic Acid), Gelling Agent (Pectin), Concentrates (Black Carrot, Blueberry, Pumpkin), Natural Flavouring), Gum Acacia, Raising Agent (Sodium Bicarbonate, Cream of Tartar), Flavouring, Salt, Sweetener (Sucralose). Chocolate Chip Flavoured: Milk Protein, Glycerine, Glutamine Peptide (Wheat), Oat flour, Vegetable Oil (Palm), Chocolate Chips (9%) (Cocoa Mass, Sugar, Emulsifier (Soy Lecithin), Flavouring), Maltodextrin, Soy Protein, Cocoa Powder, Raising Agents (Sodium Bicarbonate, Cream of Tartar), Flavouring, Sweetener (Sucralose). White Chocolate Chip Flavoured: Milk Protein, Glycerine, Oat Flour, Glutamine Peptides (Hydrolysed Wheat Gluten Peptides), Maltodextrin, Vegetable Oils (Palm, Rapeseed), White Chocolate Chips (9%) (Sugar, Cocoa Butter, Whole Milk Powder, Emulsifier (Soy Lecithin), Flavouring), Soy Protein, Whole Milk Powder, Raising Agents (Sodium Bicarbonate, Potassium Bitartrate), Flavouring, Sweetener (Sucralose). Chocolate Chip: Oat Blend (40%) (Rolled Oats, Toasted Malted Oats (Wholegrain Oat Flakes, Palm Oil, Barley Malt Extract)), Protein Blend (14%) (Milk Protein, Whey Protein Concentrate (Milk)), Humectants (Glycerol, Maltitol), Hydrolysed Collagen, Milk Chocolate Flavoured Coating (8%) (Sweeteners (Isomalt, Sucralose), Non-Hydrogenated Palm and Palm Kernel Oil, Whey Powder (Milk), Fat Reduced Cocoa Powder, Fortified Wheat Flour (Wheat Flour, Calcium Carbonate, Iron, Niacin, Thiamin), Emulsifiers (Soya Lecithin, E476), Natural Flavouring), Isomalto-Oligosaccharides, Fat Reduced Cocoa Powder, Chocolate Chips with Sweetener (Sweetener (Maltitol), Cocoa Mass, Emulsifier (Soya Lecithin), Fat Reduced Cocoa Powder, Natural Flavouring), Flavouring, Rapeseed Oil, Antioxidant (Natural Mixed Tocopherols). Wheat Flour, Molasses, Glutamine Peptides (Hydrolysed Wheat Gluten Peptides), Oat Syrup, Chocolate Chips (9%) (Cocoa Mass, Sugar, Emulsifier (Soy Lecithin), Flavouring), Cocoa Powder, Olive Oil, Pea Protein, Soy Protein, Water, Fructo-Oligosaccharide (Chicory), Stabiliser (Acacia Gum), Coconut Oil, Raising Agent (Sodium Bicarbonate), Flavouring, Salt, Sweetener (Steviol Glycosides). Chocolate Chunk Flavour: Oats (25%), Golden Syrup, Isolated Soy Protein (19%) (Soya Lecithin), Fructo-Oligosaccharide, Salted Butter (Milk, Salt), Margarine (Vegetable Oils (Palm Oil, Rapeseed Oil), Water, Salt, Natural Flavouring, Emulsifier (E475)), Dark Chocolate Chips (5%) (Cocoa Mass, Sugar, Emulsifier (Soya Lecithin), Vanilla Extract), Whey Protein Isolate (4%) (Milk), Brown Sugar. Caramel Hazelnut: Protein Blend (22%) (Whey Protein Concentrate (Milk), Milk Protein), Humectans (Glycerol, Malitol), Milk Chocolate Flavoured Coaitng (14%) (Sweeteners (Isomalt, Sucralose), Non-Hydrogenated Palm and Kernel Oil, Whey Powder (Milk), Fat Reduced Cocoa Powder, Fortified Wheat Flour (Wheat Flour, Calcium Carbonate, Iron, Niacin, Thiamin), Emulsifiers (Soya Lecithin, Polyglycerol Polyricinoleate), Flavouring), Hydrolysed Collagen, Sugar Free Caramel (10%) (Humectants (Glycerol, Malitol), Maltodextrin, Oligofructose, Water, Coconut Oil, Skimmed Milk Powder, Thickener (Modified Waxy Maize Starch), Colour (Plain Caramel), Gelling Agent (Pectin), Firming Agent (Calcium Lactate), Emulsifier (Soya Lecithin), Salt, Flavouring, Thickener (Xanthan Gum)), Soya Protein Ioslate, Fructo-Olisaccharides, Water, Roasted Nibbed Hazelnuts (4%), Rapessed Oil, Flavouring, Salt, Sweetener (Sucralose), Antioxidant (Natural Mixed Tocopherols). Warning: Excessive consumption may cause a laxative effect. 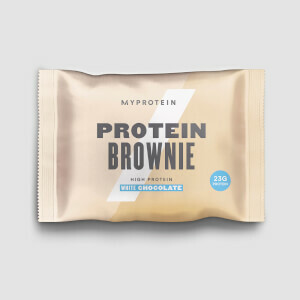 Chocolate Mint Flavour: Cocoa Butter (33.9%), Whey Protein Crispies (Whey Protein Isolate (22.43%) (Milk), Rice Flour (3.5%), Emulsifier (Soy Lecithin)), Cane Sugar, Cocoa Mass (11%), Cocoa Powder (9.9%) Flavour (Natural Vanilla Flavouring, Natural Peppermint Oil). Minimum 54% Cocoa Solids. The nutritional information is based on the Caramel Hazelnut Flavour version, when choosing an alternative flavour the nutritional values may vary. *Flavours, products and sizes are as shown, but may be substituted without notice dependant on stock levels. I love protein snacks, constantly got a cupboard full of oats and whey or sci mx bars, got this box for free and it was a nice change but the my bar zeros aren't great. love the brownie and cookies though! worth a try all the same. I ordered the protein snack box to try out a variety of snacks as I wasn't sure what to get. My favourites have been the carb crusher (caramel nut), this is really nice and filling, and the baked protein cookie (chocolate), also tastes great and is a substantial snack. The other snacks have been OK apart from the protein brownies, these were definitely once of the worst protein snacks I've tried, awful taste and awful texture. Awesome to have a mix of protein snacks. Personally my goals are not in line with consuming these but all the same I have enjoyed them. Good to see what is on the market and to treat myself a little bit! Great variety of snacks and their flavours. There was only one that I didn't like as much as the others. However, that was the point of buying them, to see what I enjoyed so I could then possibly bulk buy my favourite. What a nice box of treats, it was great to see what is there, taste it before we buy more of them. The chocolate is one of my favourites for sure. Great pack and good choices in the pack if you dont want to buy a box of all the same flavour!